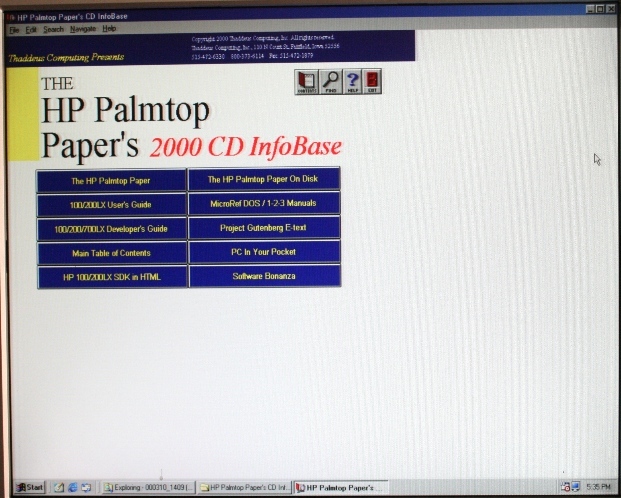 This disc image contains the HP Palmtop Paper 1999 CD InfoBase. The CD includes user manuals for the 100LX and 200LX as well as Lotus 1-2-3 and other manuals. It also includes all editions of The HP Palmtop Paper, the 100/200/700LX developer's guides, and lots of bonus software to use with the palmtops. The original software came on a CD. The compressed size of the ISO file is 256MB. Please contact us if you would like to obtain this software.